The Bay Area’s commitment to ethical food is almost taken for granted these day, with seemingly every new restaurant touting ingredients and sourcing that would make Michael Pollan proud. But that doesn’t mean that it’s become any less important to focus on sustainable food. Most of us don’t have the power to make the kind of large-scale decisions that affect our food systems the way say, a giant food conglomerate or the government can. But we can choose to buy organic, or select a restaurant that emphasizes sustainability for our Friday night date. Here are just a few of the restaurants in the Bay Area that are trying to create a better world through the growing, selection and preparation of the food they serve. 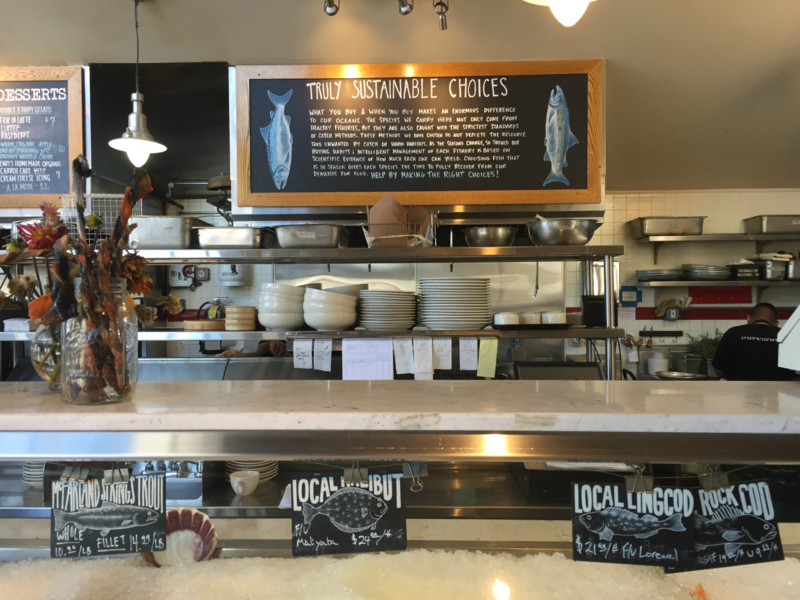 But we know this list is just a sampling of the many great environmentally-friendly restaurants in the area. Did we miss your favorite? Let us know in the comments below. For those willing to spend the money, it’s a charming experience. 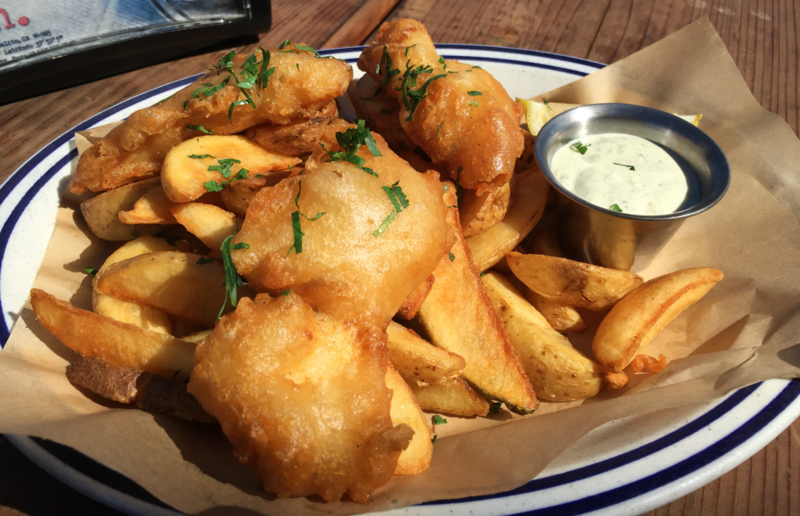 The restaurant overlooks Richardson Bay, so there’s a waterfront view as you enjoy winning renditions of classic dishes like fish and chips--shatteringly crispy, served with plump steak fries and an herbaceous tartar sauce. 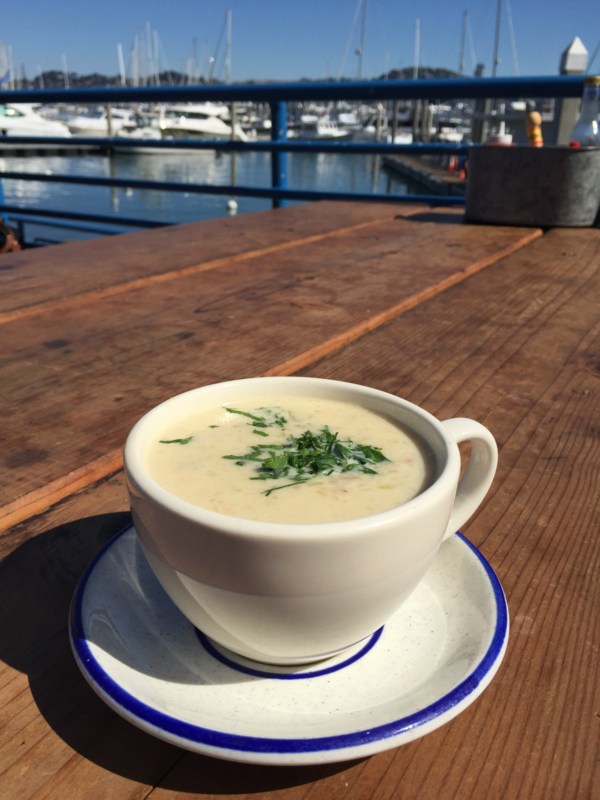 Their clam chowder is far better than the bowls of cream you get at Pier 39. It’s thinner but boasts a stronger clam flavor, with large pieces of bacon and even larger chunks of potatoes. They also feature several fish of the day, which you can get in a sandwich, with pasta or with a salad. On our visit it was squid, herring and trout. The rainbow trout, sustainably farmed from McFarland Springs, was cooked perfectly, with a hint of char from their wood-fired grill. 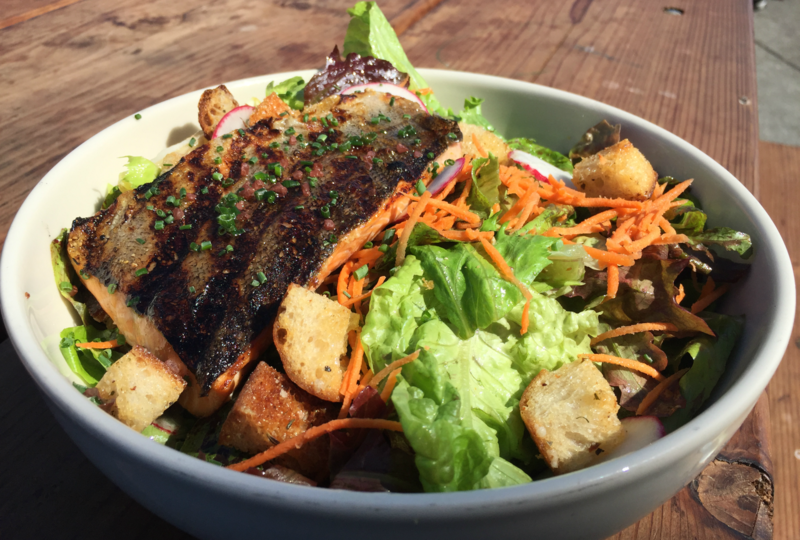 Atop a bed of greens and paired with a bright vinaigrette, it was an ideal lunch for a sunny Sausalito afternoon. 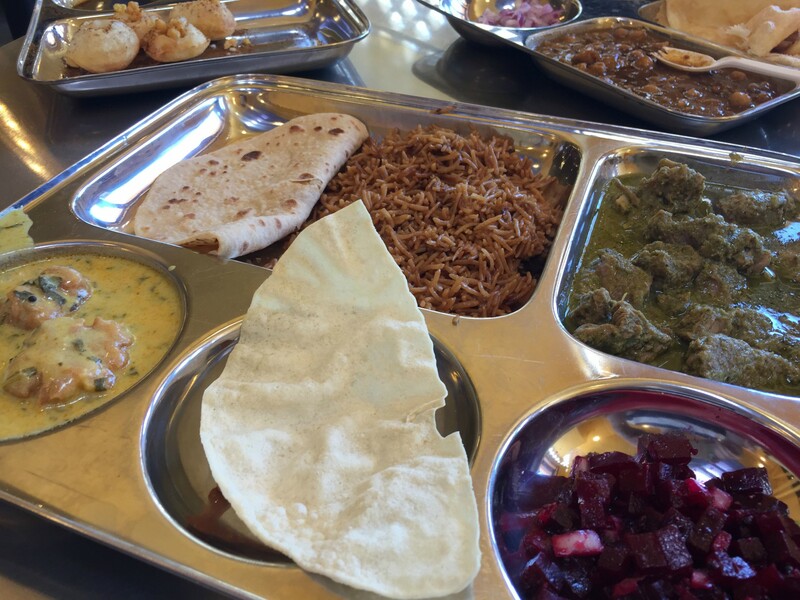 Every day, people flock to an unassuming part of West Berkeley for the Indian street food at Vik’s Chaat. For its fans, which range from groups of coworkers out for a birthday lunch to spandex-clad bikers debating the best post-workout meal (a peanut butter sandwich, one argued), the draw is the restaurant's mix of entrees and smaller dishes. You can get a lunch special, where you’ll be presented with heavy tray of well-seasoned lamb (or chicken or fish if that’s your preference) served with rice, chapati, dal, achar, raita and papad. 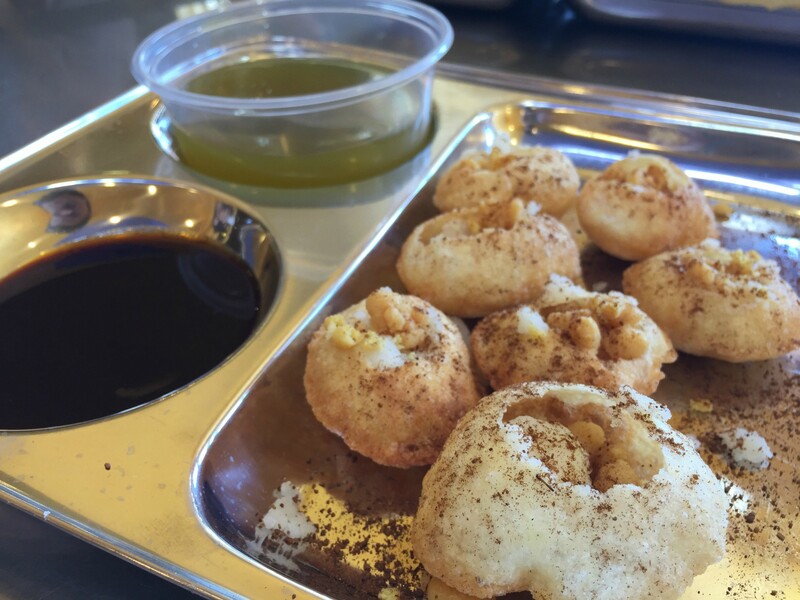 Or you can get a variety of smaller dishes to share, like the crunchy pani puri--a deep fried puff filled with chickpeas, just waiting to be filled with the accompanying mint water or a dollop of tamarind chutney. 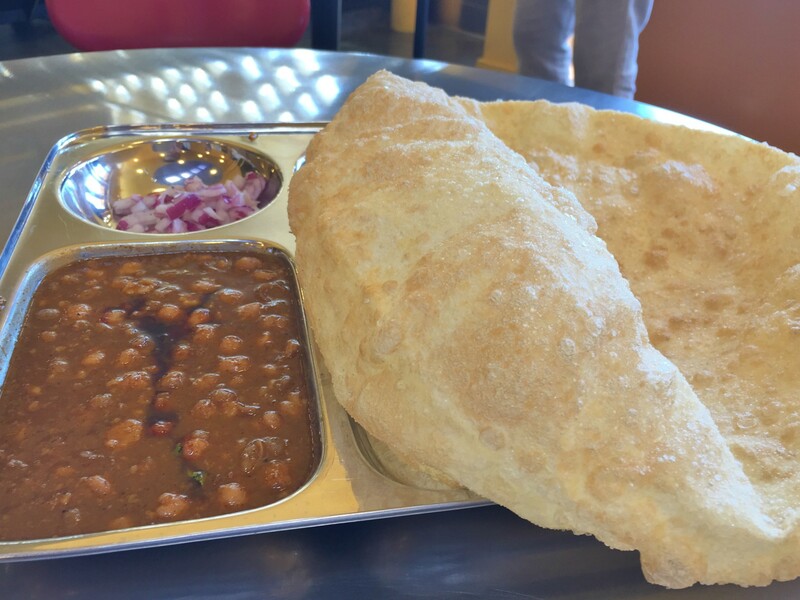 And there’s the drama of the cholle bhature--labeled on the menu as “the big puffy thing”-- which comes out towering and slowly deflates so you’re able to rip a piece off and top it with chana masala. But what most people don’t know is the restaurant is also a model of sustainability. 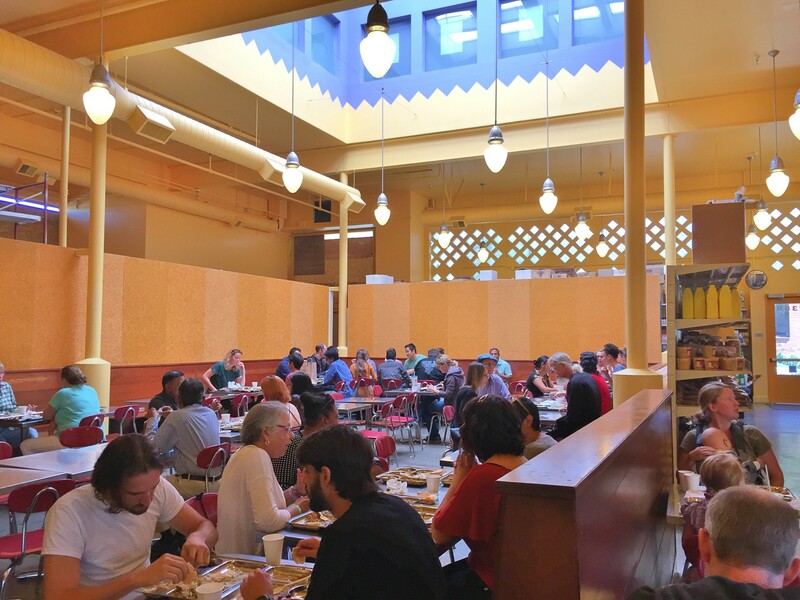 Sure, they have separate trash cans for composting, but the building itself boasts several eco-friendly touches: it relies on skylights for cooling, instead of air conditioning; the wooden benches and wainscoting are recycled from a San Francisco gym; and part of the building’s outside was made from sand. 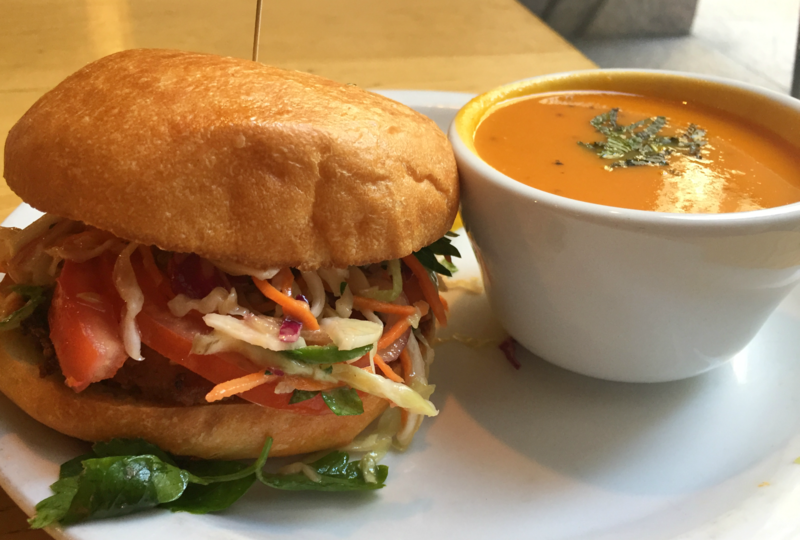 The inclusion of “organic” in the name is the first tip off that the Bay Area fast casual restaurant chain The Plant Cafe Organic, with six locations scattered around San Francisco and Mill Valley, is committed to sustainability. And indeed, they are, with 100% of the restaurant's ingredients coming from organic sources. 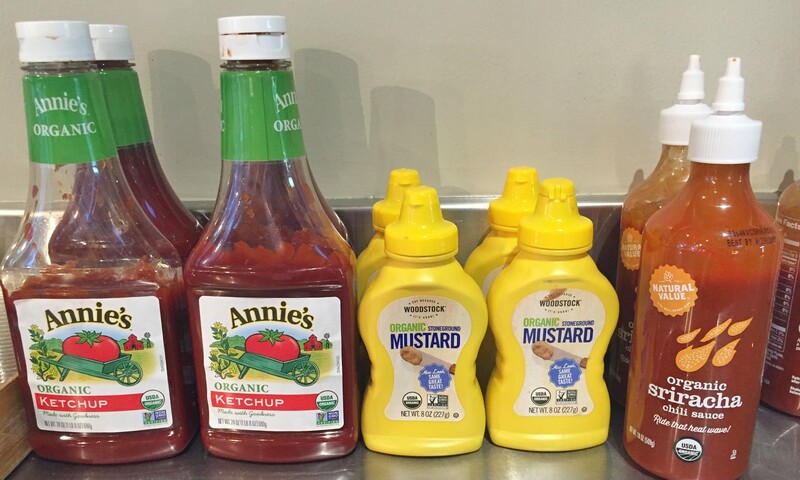 Even the condiments--ketchup, mustard, hot sauce--are organic. Their menu includes lots of healthy options like grain bowls, meal-worthy salads and smoothies (on my visit, many besuited Financial District workers were happily slurping tumblers of green liquids) but there’s also less wholesome options. A fried chicken sandwich was appropriately crispy, topped with a pile of crunchy, mildly spicy slaw. The restaurant also changes seasonally. 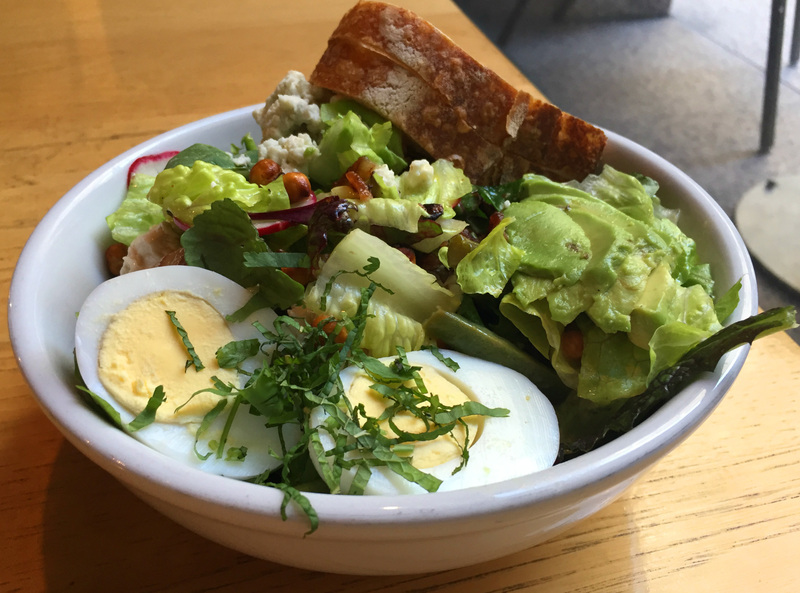 Their summer cobb had all the best parts of the original--egg, blue cheese, avocado--but with an added crunch from roasted chickpeas and green beans and a freshness from a zingy lemon flax vinaigrette. 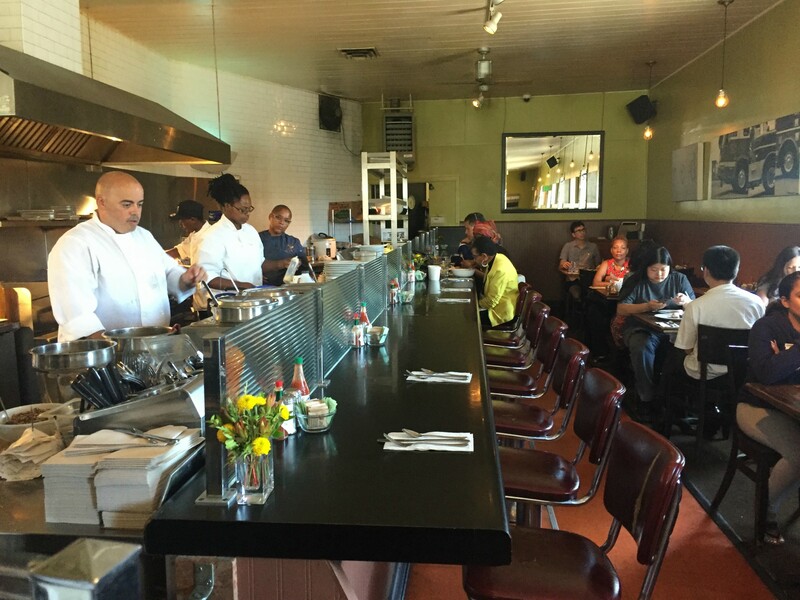 Brown Sugar Kitchen has big plans for its future. There’s the forthcoming move from West Oakland to Uptown, and new plans for a smaller spot at the Ferry Building. It’s easy to understand why they’re eager to expand. They’re so beloved that a wait for their weekend brunch--featuring their star dish, chicken and waffles--can stretch into multiple hours. In addition to their exemplary food, they’re also focused on reducing the amount of waste they produce. Chef Tanya Holland has committed to a new zero waste initiative, meaning that they’re focused on composting --a nearby community garden gets their food scraps and eggshells-- as well as stretching ingredients as far as they can. 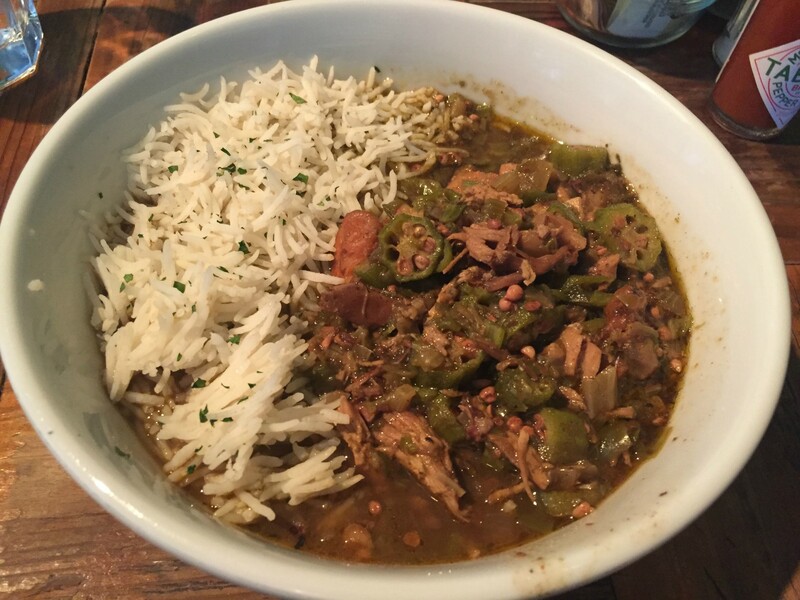 That means leftover vegetables from their veggie scramble might find their way into their swamp-colored gumbo, a rich, aromatic mix of vegetables and chilies tangled around shrimp and smoked chicken. Similarly, their hash features pork smoked in house and uses up leftovers from their pulled pork sandwiches. 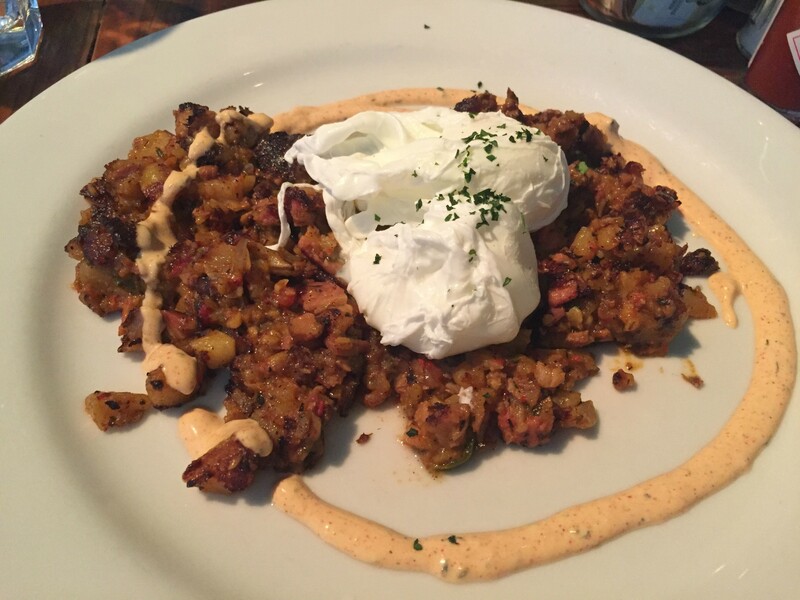 It’s then crisped together with potatoes, peppers and onions and topped with poached eggs for a filling, spicy meal. 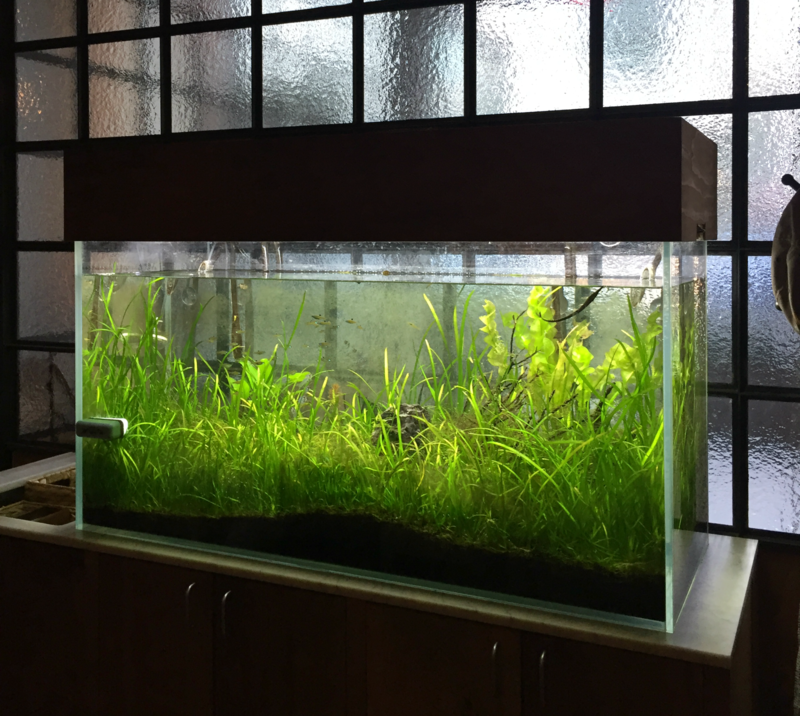 The Perennial wants to “fight climate change with delicious food and drinks.” This admirable goal is achieved through a variety of creative methods that go beyond the Bay Area mainstay of “local and organic produce.” They use an aquaponic greenhouse to raise their greens and fish. Their bread isn’t Acme or Tartine, but made in-house from Kernza, a perennial grain that’s better for the soil than wheat. Their meat comes from ranches that use carbon farming, a technique that produces less methane than traditional methods. They’ve received a lot of attention for their efforts--”Did you see the New York Times article?” a beaming server asked the table next to us--and on a recent weeknight, the place was filled with couples on dates and cheerful groups of coworkers. The menu is available as a three or four course meal, but is also available a la carte, our server said. When she found out that my friend and I wanted to order a few dishes and split an entree, she muttered something about needing to order two entrees and OpenTable points as she walked away. (I scoured my reservation email and the website, but didn’t see any such requirement.) Eventually she returned, dumping our dishes on the table. The Kernza bread was hearty and slightly nutty, similar to a levain sourdough. 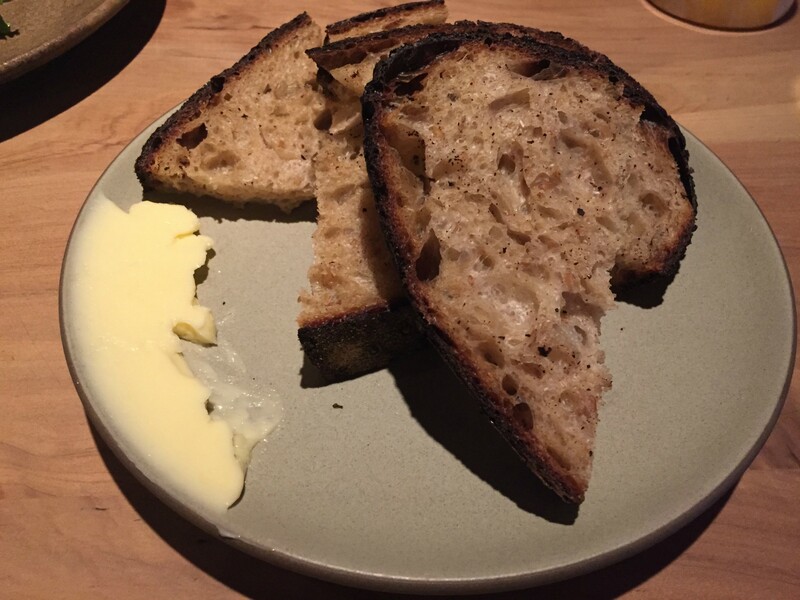 “If I could only eat this bread the rest of my life, I’d be ok with that,” my friend said, and I agreed. 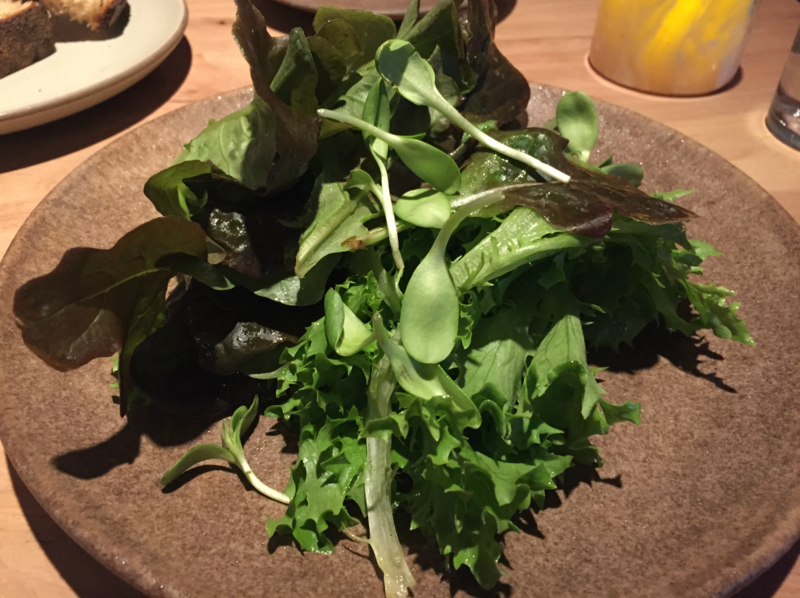 The aquaponic greens come from the restaurant's West Oakland greenhouse, and were crisp, delicately dressed in a vinaigrette atop a few dabs of a creamy, avocado based dressing. 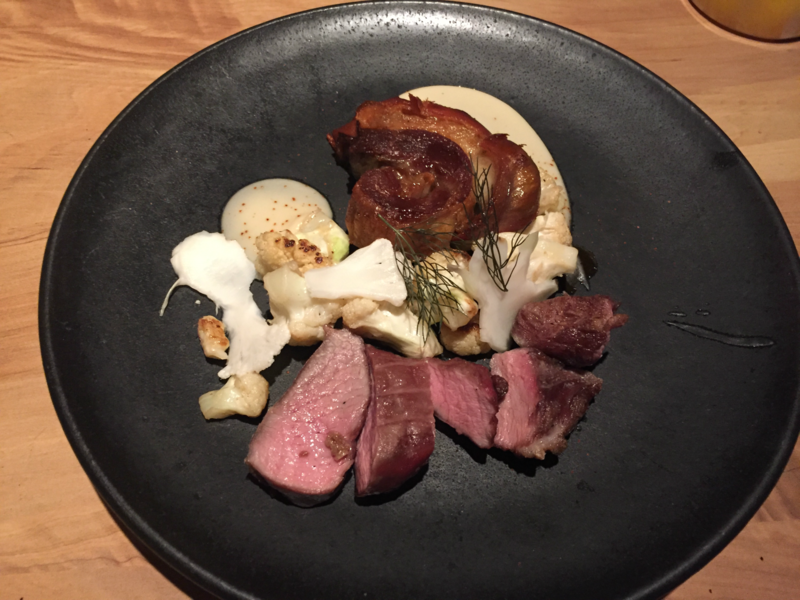 Our lamb (a note on the menu mentioned that a carbon ranching surcharge would be added to our bill “to reflect the true cost of beef and lamb”) was meltingly tender, surrounded by cauliflower prepared in a variety of methods. Some florets were pickled, others roasted, and the whole arrangement was accompanied by a slick of roasted cauliflower puree, assertively salted and almost cheesy tasting.